12:42am – Cee-C and Tobi are inside the closet room once again trying to solve their differences. 11:38am – Meanwhile Teddy A is seated by the jacuzzi smoking. 10:49pm – The housemates have now exited the arena and are inside the closet room celebrating their wager victory. 10:46pm – Big Brother gives his judgement on the housemates’ wager for this week, he says they have won their wager. 10:43pm – Congratulations to Bambam for winning challenge number 9. 10:41pm – Bambam is taking on challenge number 9. 10:40pm – Congratulations to Miracle for winning challenge number 8. 10:37pm – Miracle is taking on challenge number 8. 10:36pm – Congratulations to Nina for winning challenge number 7. 10:22pm – Nina is taking on challenge number 7. 10:21pm – Big Brother makes the housemates an offer, if they win 2 out of the remaining 3 challenges, he’ll let them win their Wager otherwise they’ll have a long weekend. 10:19pm – Tobi might have tried harder if he was given more time but he has failed challenge number 6. 10:09pm – Tobi is taking on challenge number 6. 10:07pm – Lolu has failed challenge number 5. 10:05pm – Lolu is taking on challenge number 5. 10:03pm – Congratulations to Teddy A for winning challenge number 4. 10:01pm – Teddy A is taking on challenge number 4. 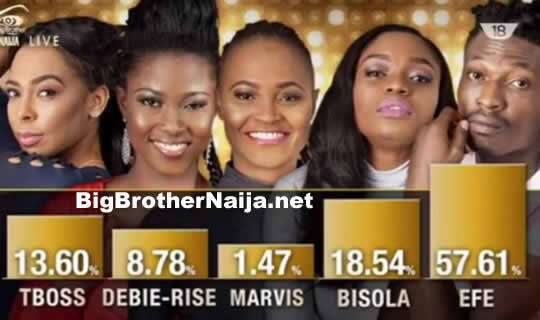 9:55pm – Cee-C has lost challenge number 3. 9:49pm – Cee-C is taking on challenge number 3. 9:46pm – Alex has failed challenge number 2. 9:42pm – Alex takes on challenge number 2. 9:39pm – Rico Swavey’s time is up and he has failed the challenge. 9:35pm – The championship challenge kicks off with Rico Swavey taking on Challenge number 1. 9:30pm – The housemates are in the arena for their Final Championship Challenge of the week, we hope you’re all watching..
9:10pm – The housemates are getting ready and preparing themselves for their final championship challenge of the week. 8:58pm – It’s raining heavily but our housemates are safe inside the house. 8:52pm – Teddy A is in the garden smoking his cigarettes. 8:32pm – Big Brother reminds the housemates that they have 30 minutes before their Final Championship Challenge of the week. 8:00pm – Cee-C, Bambam and Alex are in the lounge playing the dice game. 7:15pm – All the housemates are gathered in the lounge, some are resting, Alex is talking about the evicted housemates. 6:47pm – Teddy A and Bambam are in the kitchen cuddling. 6:41pm – Teddy A is washing dishes. 6:27pm – Miracle and Rico Swavey are in the kitchen preparing the housemates’ dinner meal. 5:50pm – Alex and Tobi are on the couch having a conversation. 5:33pm – The housemates win their challenge after which they exit the arena. 5:17pm – The housemates are in the arena for their fifth championship challenge. 5:11pm – Big Brother instructs all the housemates to go to the garden and prepare to move to the arena. 4:57pm – Tobi, Lolu and Teddy A are in the garden having a conversation as the latter smokes his cigarettes. 4:40pm – Head of House Miracle reads out a task brief to his fellow housemates who are all gathered in the lounge. 4:25pm – The housemates have now woken up. 2:58pm – Lolu is seated alone drinking some juice..
2:15pm – Majority of the housemates are sleeping. 1:50pm – Lolu is busy cleaning the house. 1:08pm – Looks like there is a nice little congregation on the beds today, great to see some unity after all the division in the #BBNaija House. 11:16am – BamBam and Teddy A are taking things to a whole new level with Teddy A affectionately squeezing BamBam’s pimples in the kitchen – What a way to start the day. 9:11am – The housemates are now having breakfast. 8:30am – The housemates are done with their morning workout session, some of them are now taking showers and cleaning themselves up. 7:50am – The housemates are in the arena taking part in their routine morning workout. 7:10am – Housemates have began waking up one by one. 6:45am – The housemates are still sleeping after having a very busy day yesterday. Good morning to you all and welcome to day 53 of Big Brother Nigeria 2018, follow today’s Live Feed Blog for all the latest updates. You can as well check out yesterday’s highlights Here.